It’s really a shame that after reading the first four issues of Edge of Oblivion I wasn’t really impressed with what Taylor brought to the table. Given his pedigree as a writer, a certain set of expectation was placed into my mind when this book was announced at NYCC last fall. After rereading the past four issues, this is definitely a superior story in comparison to Lost Army, but I let my own personal expectations so high that this book couldn’t possibly live up to them. Either way let’s what Taylor and Ardian Syaf have in store for the penultimate chapter of Edge of Oblivion. Heading into this issue with I was initially dismayed when the opening sequence was flashback dedicated to Guy Gardner’s childhood and the dark horrors that accompany it, fearing another Lost Army situation. Thankfully Taylor manages to not only give new readers a glimpse into Guy’s past but also weaves into the action effortlessly, making for a well timed moment. Its borderline cliche in the manner Taylor implements the flashback with your typical action sequence but it’s still a great moment none the less. Last issue I commended Ardian Syaf and his attempt to mimic Van Sciver’s art, which gave the a sense of cohesion from the third to the fourth issue. That all changed with this issue, as Syaf’s art was all over the place. Any sense of art cohesion is now gone, as Syaf’s style ranged from a rougher version of David Finch, to a typical DC house style, to a dash of Van Sciver. This is most likely due to three different inkers working on this particular issue. In most cases I can overlook multiple inkers but it was too jarring of an experience for me to not ignore. The actual interior art was well done (with the exception of Kilowog’s face and other facial expressions), with some fun action sequences. I will commend the art team on nailing Guy’s perfect smirk, the kinda smirk when you know that person has something up their sleeves. The actual fight between the different corps factions didn’t feel forced and contrived, since Taylor laid the foundation as to why John wouldn’t believe Guy and he doesn’t exactly have a reason to not believe that the titans he was protecting were in fact World Eaters. Seeing both Ionlande (and her own brigade) and Mogo join the fight was perfectly timed and it worked within the narrative of the overall story. Some might see Mogo as a deus ex machina, but those people probably don’t actually know what that word means nor do they know it’s proper use. This will be a criticism of not only this issue but this series a complete package. 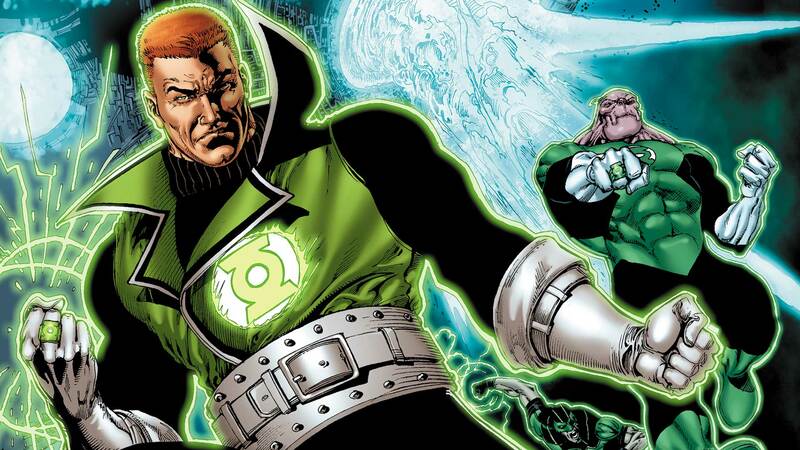 With the title of Green Lantern Corps, one expects character development to be passed around the group of. That character development could be small or large depending on the size of the team. Similar to Lost Army this book is all about Guy Gardner and while I understand the notion that Guy Gardner is the driving force of this series, but I still would have liked other Lanterns to have something more than exposition. Edge of Oblivion remains consistent in being a fun Green Lantern story, but the inconsistent art hurt the story. Even though the ending is all but predictable I’m still invested enough to see how Taylor wraps up this mini series. Click Here for fun movie commentaries! Um, how about proper use of the word, “it’s”…. ?